who fell to the abyss. and now its strength reflects its wielder's humanity. 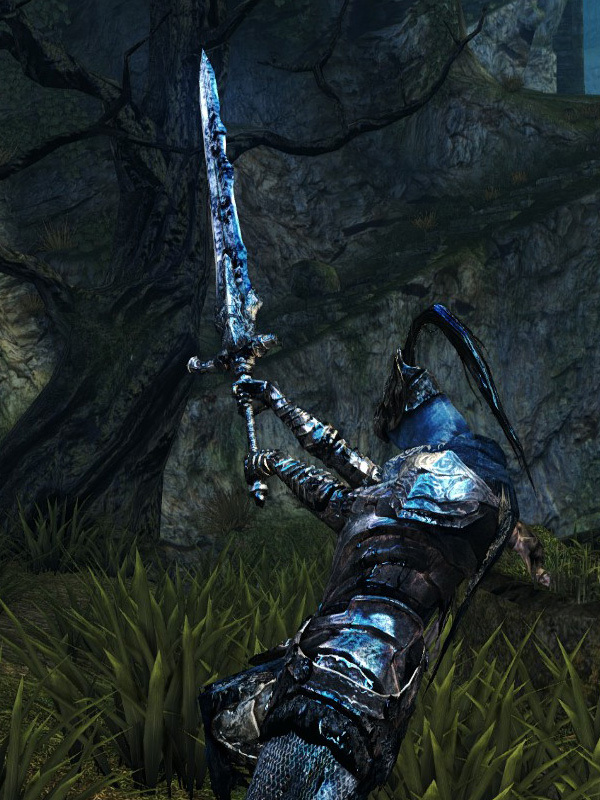 Like the Cursed Greatsword of Artorias, this weapon has an INT and FTH requirement even though it has no non-physical damage. With stats needed to wield* Greatsword of Artorias (STR 22, DEX 18, INT 18, FTH 18), Abyss Greatsword has 240 + 106 = 346 physical damage. At 10 humanity, Abyss Greatsword will have 421 physical damage. *This article originally stated that the stats required to wield this weapon are STR 24, DEX 18, INT 20, FTH 20. This may have simply been a mistake, or it could be that earlier versions of the game had different requirements. The 'correct' stats listed above (STR 22, DEX 18, INT 18, FTH 18) have been confirmed in the Prepare to Die edition of the game as of June 2017. Cannot be buffed with spells or resins. If one does not meet the INT and FTH requirements but still meet the required STR and DEX, they will still be able to do full damage with the sword, but, will get a stagger animation that makes them immune to backstabs. This occurs because since the INT and FTH requirements don't actually affect the damage output, but rather the STR and DEX, they can completely disregard investing to get the INT and FTH stats to 18. However, the drawback to this is that it will not allow one to do any follow ups, as once this sword makes contact, it will bounce off, stopping the user from doing anything for a few seconds. The one-handed R2 is a double circular slash (Only connects once but, can hit a second enemy further away). The two-handed R2 is a somersault, followed by a vertical slam (knocks down most humanoid enemies). 55% STR, 55% DEX scaling.